Whether your sabbath falls on Saturday or on Sunday, everyone is sure to love the yummy religious goodness of today's Gallery entry. Obviously this is an attempt at youth outreach, but the title of the program just struck me as odd. "Just Older Youth Up to Something"? Depending on how you look at it, that might not be such an innocent thing. And wouldn't it have taken them just a little more effort to make this acronym one with an appropriate spelling? If they wanted the "o" in there and really wanted to emphasize their kids' actions, then perhaps they could have called this program "Just Older Youth Overtly Up to Something." Or if they wanted to downplay things, then perhaps "Just Older Youth Ordinarily Up to Something." Or maybe they could show how preoccupied their kids are with "Just Older Youth Obsessively Up to Something." Or if they're wanting to go for that religious green feel, then "Just Older Youth Organically Up to Something." Still, they could have opted for "Just Older Youth Orally Up to Something" and see their attendance shoot through the steeple. Thanks for the post, but I felt the need to comment. 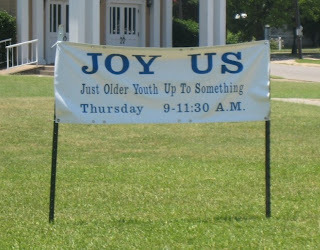 The "Joy Us" group is not intended for youth/college aged teenagers, but rather an older group of folks (such as 50+). This sign may seem misleading, but the sarcasm isn't appreciated.